Hey, it stopped raining! We’ve had a wet couple of days here on Maui, but things are settling back to normal—for now! We certainly won’t forget that it’s hurricane season. However, plenty of Maui locals are getting down to the business of planning their weekends. With fingers crossed that the sun will still be shining come Saturday, many of us are planning beach days, hiking ventures, and other outdoor activities. Since my husband and I have a two-year-old in tow, we like to keep it a bit more low-key. 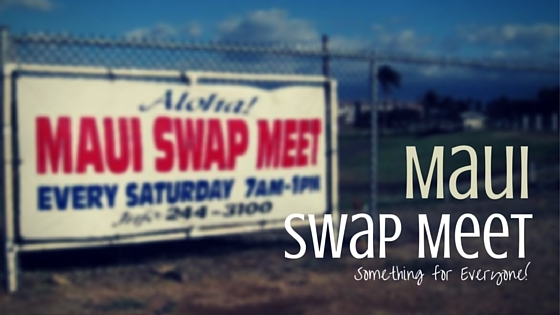 Our Saturday plans often include a trip to the Maui Swap Meet—where we can easily spend a few hours getting some sunshine, exercise, and great deals! 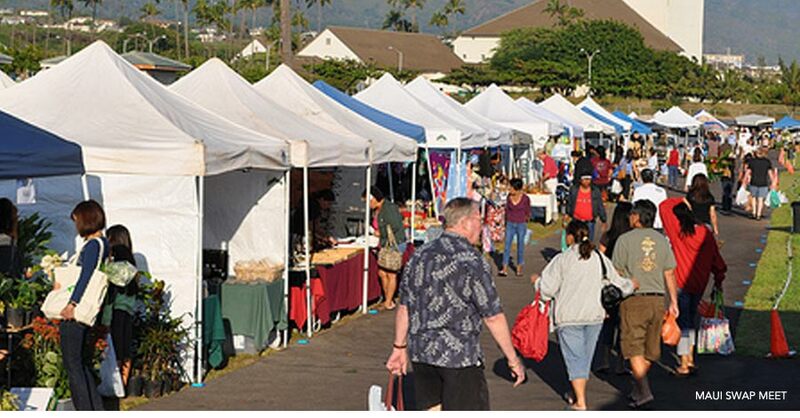 The Maui Swap Meet has been going on for years, and now takes place right behind the University of Hawaii Maui College. If you’ve been looking for just that perfect thing to take home from your trip, you might just find it at the Swap Meet! With rows and rows of tents, tables, and trailers, it can be hard to figure out where to go! But, hey, it’s Saturday, and it’s a great day to just stroll around and take it all in. 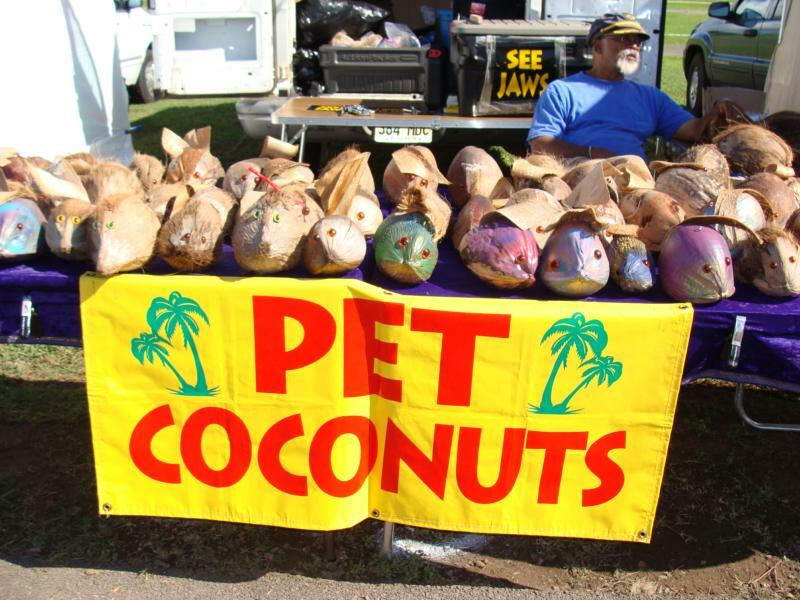 Need a pet coconut? Don’t be ridiculous– of course you do. What will you find at the Swap Meet? Is it worth it to get up early on a precious vacation Saturday and make the drive into Kahului? Well, it’s certainly up to you, but I’d certainly give it a shot! You’ve got nothing to lose—other than the fifty-cent admission that keeps this Maui tradition running smoothly. You’ll find unique jewelry, interesting keepsakes, clothing items, and more! Some are locally-made, handcrafted treasures, and others are import items that you can snag at a great bargain. There’s something to be said for both! In addition, you’ll find a plethora of food vendors, so whether you want a little snack (shave ice, anyone?) or are ready for a hearty lunch, you can chow down right there at the Swap Meet. On a hot day (and we’ve had our share of those recently), I make a bee-line straight to the hand-pressed lemonade stand. It can be a little overwhelming to check out absolutely everything– but just take your time! Finally, if you’re staying in a condo with access to a kitchen, don’t skip past the fruit and vegetable vendors! You’ll get some of the best deals around on produce, and you’ll find locally-grown tropical fruits that may ruin you for your grocery store back home. I love picking up the long Japanese eggplants to throw on the grill, some calamansi for cocktails, and a bunch of fresh herbs for my steak marinade. I pay a fraction of what I would at Whole Foods, and get that tasty, locally-grown goodness from appetizers to dessert. Whether you’re looking for souvenirs, local snacks, beautiful artistic keepsakes, or anything in between, the Maui Swap Meet has something for you. It runs from 7:00 AM to 1:00 PM, at 310 Kaahumanu Avenue in Kahului. Parking is free and plentiful, and the admission fee is a steal at fifty cents per person—kids twelve and under are free! Best of all, a trip to the Swap Meet in the morning puts you right in Central Maui for plenty of other adventures for the rest of the day. Hit up Iao Valley for a quick, cool hike, or even enjoy the Maui Ocean Center on your way back to your resort. The Maui Swap Meet is definitely my top pick for a Saturday morning outing! Last year, Hawaii welcomed 243,390 cruise-ship guests to the islands, whether they arrived by ship, or boarded one upon their arrival. Compared with other visitors, that is a very small number, but it’s still quite a few people who are here to enjoy everything that out unique state has to offer. If you’ll be part of that group soon, we’re sure you’ll want to experience the very best of Maui, and we’d love to be a part of your trip! We host cruise ship guests on a weekly basis, thanks to the ever-present Pride of America ship that docks in Kahului Harbor every Sunday, and leaves each Monday evening. Popular tours with Pride of America guests are our Hana Sky-Trek, Summit Lavender Sojourn, and Crater & Rainforest tour. 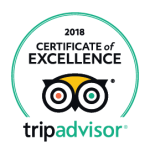 Because of the Pride of America’s consistent schedule, and the fact that we welcome hundreds of its passengers on our tours monthly, we’re absolute pros! We’ll pick you up in a timely manner, and our Tour Guides are the absolute best at getting folks back well before the “all-aboard”—without missing a single moment of our luxury tours! The other cruise line that frequents our island most often is Princess Cruises. Docking (usually) in Lahaina Harbor, this upscale cruise line’s schedule can vary a bit—but not to worry! We stay on top of the latest schedules, and, again, host numerous guests on our tours virtually every time a Princess vessel sails our way. Of course, Princess and Pride of America are not the only ships that visit the Valley Isle. From Carnival Cruise Lines to Disney, we see plenty of ships in our harbors throughout the year. 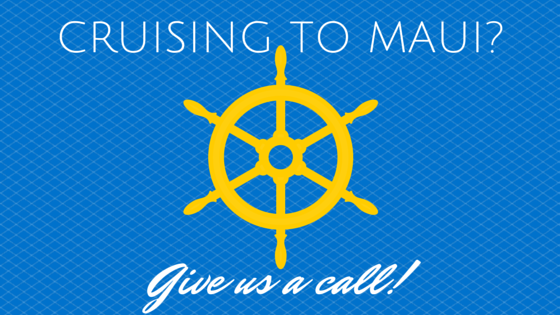 Looking to book a tour from your cruise ship? Don’t know where to start? Give us a call at 1-800-817-1234, and we’ll help you with everything from choosing your perfect tour to where to meet us on the day of! If you’ll be tendering in Lahaina, we’ll be right there at the pier once you disembark your tender. For ships docking in Kahului, you’ll meet us right across the street from the harbor at Maui Mall. Once you book your tour, we’ll provide you with detailed instructions on exactly where to go. 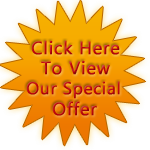 Don’t worry—we make it easy for you to get to your tour and get on your way as smoothly as possible. If you’re planning to take to the seas for your Hawaii vacation, call or drop us a line soon to plan your perfect day in paradise! We love nothing more than helping people realize their idea of true Maui bliss, whether they’re at a hotel, condo, resort, or ship! See you soon, cruisers! Maybe it’s the last few days of vacation, and a quick peek at your bank or credit card app brings you to the shocking realization of exactly how much you spent on Maui—especially on food! I know, it’s easy to get swept up in the amazing restaurant scene here on the island, especially in the resort areas. Before you buy yourself a jar of peanut butter to subsist on until you get home, check out these places that are both delicious and easy on the wallet! When I moved to Maui, I was twelve, and too cool for everything. I heard about this restaurant, and immediately declared that I would never eat in an establishment called “Tasty Crust.” Years later, my then-boyfriend-now-husband heard that I’d never been there, and marched me in for breakfast one Sunday morning. Let me tell you, I did not know what I was missing. If you want a pancake, and I mean, a HUGE, dinner-plate-sized, fluffy pancake, check out this unassuming Wailuku eatery for one of the best breakfasts on the island. Add on a side of eggs or meat for just a bit more, and you’ve got a meal that will keep you going all morning, all for around six or seven bucks. Don’t forget, though: bring cash! Not far from the airport, this is one of the best places on the island to get a cheap yet elegant lunch. Generously portioned sandwiches served alongside tasty Caesar salad will set you back around seven or eight dollars, but their daily plate lunch special (usually $6.95) is really the best deal to be had, and the selection always changes. For local flavors at amazing prices in an upscale setting, this is the place to be! 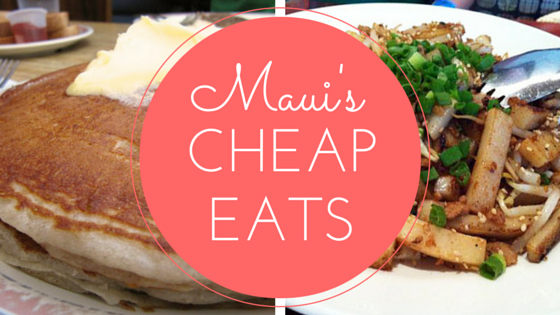 Also, if you’ve got little ones, their keiki menu prices are almost un-beatable. With as red-hot and trendy as Star Noodle is (seriously, expect to wait at least an hour if you’re dining in), you might not expect it to be reasonably priced. But it is—most of their noodle dishes and share plates are right around twelve bucks. For a party of four, three to four plates is more than enough, because they’re certainly generous with their portions for most dishes. I like the Lahaina Fried Soup (an addictive take on chow fun), the Filipino Bacon & Eggs, and the Pad Thai. The priciest thing on the menu is the drinks, so if you stick with water or soda, you can even do dessert and still leave for around $25 per person. Speaking of dessert, always ask what their gelato flavors are for the day; they do some of the most unique flavors I’ve ever seen, like sweet corn, lavender shortbread, and black-pepper caramel. For seven dollars, you get three flavors that will most likely blow your mind. I know, I know: Tommy Bahama is definitely not what you’d call “cheap eats”—except at happy hour! Their “Island Time” Happy Hour is one of the best deals I’ve come across. They offer great discounts on their amazing cocktails (and their bar staff is incredible, by the way! ), but the almost-unbelievable deal is on the food. Once, I added it up: if you ordered one of everything on their Island Time food menu, you’d spend forty-two dollars! So, for a drink or two, and some amazing pupus (including my favorite fish tacos ever), you can easily spend less than thirty dollars for a decadent afternoon! Sweet! For the most part, Hawaii’s been very fortunate during recent hurricane seasons. Last year’s impact from Hurricane Iselle was certainly felt (especially on Hawaii Island), but it was not nearly as bad as it could have been. Over the last week, Hawaii has been keeping a vigilant eye on Guillermo, a hurricane-turned-tropical storm that seems to have veered far enough away from our islands to minimize its impact—although we are still staying cautious. 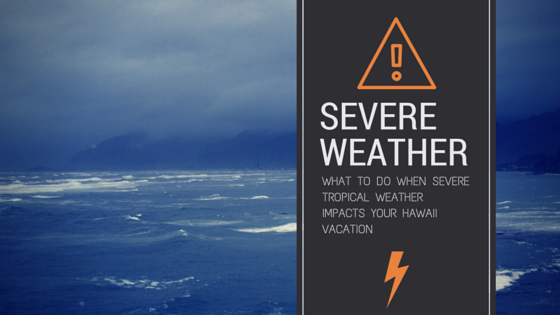 The fact of the matter is that the threat of hurricanes and tropical storms is an inevitability here in Hawaii, and while you shouldn’t let that deter you from visiting, there are a few things you should keep in mind if you’ll be vacationing between June and November. Check with your airline: If a tropical storm or hurricane looms, many airlines will allow travelers to change or cancel their flights at no additional charge. It may be worth checking into before booking (just in case), although many may enact these policies on a case-by-case basis. If a storm is on the horizon a few days before travel, you may be able to hold off on your trip. The same goes for your hotel—many allow no-penalty cancellations or changes due to severe, dangerous weather. Plan to extend: Hopefully, a storm won’t interfere with your plans to return to the mainland. However, sometimes these things happen, and your trip to Hawaii may be a few days longer than planned. If you’re packing any medications, it’s a good idea to bring an extra week’s supply along with you, just in case. The same goes for some extra cash, and be sure you plan for someone to see to your affairs at home should you be longer than you expected. Stock up early: If you’re going to be sequestered in a hotel room during dangerous conditions, remember the very real possibility of a power outage as well. It’s not a bad idea to pick up a few items ahead of time to get you through the worst of it: bottled water, non-perishable foods, flashlights, and a portable cell phone charger. Keep in mind, though, that when Hawaii residents get word of a possible storm, we hit the grocery stores up FAST. It may be difficult to find even basic necessities if you put it off for too long. Stay informed: Above all, make sure you keep yourself updated on the latest forecasts, closures, and advisories. I like having the Hawaii News Now app on my phone and tablet; I can get real-time alerts, and even watch live newscasts from anywhere. That and similar apps are free to download, and good to have even when there isn’t a severe weather threat; it’s always a good idea to get a feel for what’s going on locally! For a more traditional route, pick up a local newspaper every morning to keep up on the latest developments. Hopefully, your trip to Hawaii will be everything you dreamed it would be, but it never hurts to be prepared—even in paradise!